~ The Clarion County Historical Society was established in 1955 and chartered by the Commonwealth of Pennsylvania in 1956 as a not-for-profit, tax-exempt, educational institution. ~ In the early years the Society collections were located on the third floor of the Clarion County Court House. As space at the Court House became filled, the Society began searching for a new home, and in 1976, twenty years after the founding of the Society, the John A. Ditz property on the corner of Fifth Avenue and Grant Street was purchased. ~ The stately Sutton-Ditz House became the home of donated artifacts and collections illustrative of the history of Clarion County; its people, places, and industries. ~ The Society library, archives and offices were also located at the Sutton-Ditz, but again, due to continued donations to the collections and an increase in library services, space became limited. ~ In 1999 a search began for yet another property . The Society desperately needed more space to maintain its administrative offices, library, archives and museum store. That space was found at 17 South Fifth Avenue, directly across the street from the Sutton-Ditz House Museum! ~ The new building is known as the Milo Markle Annex and is the home of the Ralph J. and Virginia A. Fulton Library & Archives, the Thomas Sutton Store, and the Society's administrative offices. ~ With new found space at the Sutton-Ditz House Museum, many artifacts have been brought out of storage and are now being exhibited . In 2004 the Sutton-Ditz House Museum was listed on The National Register of Historic Places. 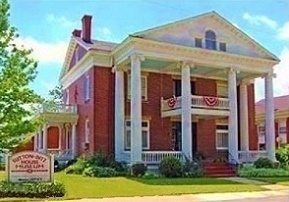 ~ The home is maintained and operated by the Clarion County Historical Society as a museum with period rooms, and permanent and changing exhibits in the Military Room, the Dar Women’s History Room, a the "General Store" Room and the Business & Industry Room. There are over 88,000 registered historic places in the United States. Search The National Registry ! Our goal is to ensure that our heritage will be preserved for future generations, and that everyone who comes through our doors feels welcomed, challenged, delighted, inspired and moved. and observances which will share the story of the individual character and distinction that makes Clarion County unique. and significant in the history of Clarion County, Pennsylvania, and its residents. in family history and the history and culture of Clarion County, Pennsylvania. 1955: First meeting to establish a historical society in Clarion County. 1956: The Clarion County Historical Society is chartered as a 501(c)3 non-profit , tax-exempt educational institution. In the early days the Society was located in a room on the third floor of the Clarion County Courthouse. 2007: The Society accepts The Historic Licking Cemetery in Churchville, donated by the Myers Family. 2008: The Clarion DAR places five granite markers in The Historic Licking Cemetery, honoring the five Revolutionary War Soldiers interred there. 2009: Terry Courson begins restoration on The Historic Licking Church, donating his time & talent. 2011: Flagpole Dedication at The Historic Licking Church & Cemetery. Ceremony by Clarion American Legion, flagpole donated by Clarion American Legion. 2011: The Society is among the first in the state to host The PA 150 Civil War Road Show, The Clarion VFW & The Clarion American Legion are sponsors. 2013: The DAR Women's History Room is dedicated at The Sutton-Ditz House Museum, made possible by donations from the Clarion Chapter DAR. 2013: The Society partners with The Clarion Area Trail Towns Co-Op, opening a Visitor Center in the Milo Markle Annex. 2014: In Feb. $50,000 is raised for the " Preserve the Porches Project", and in September the Society is awarded a "PA Keystone Preservation Grant" of $50,000 in matching funds for the porches.